Protection From The Sea Is Possible, But Expensive Norfolk, Va., has spent decades — and millions of dollars — raising houses and building barriers to successfully hold back the sea. Expanding such efforts to other vulnerable coastal areas, such as New York and New Jersey, could work, but costs could reach the billions. While New York City and other places along the Northeast coast are still recovering from Superstorm Sandy, they're also looking ahead to how they can prevent flooding in the future, when sea level rise will make the problem worse. They may be able to take some lessons from coastal Norfolk, Va., which is far ahead of most cities when it comes to flood protection. 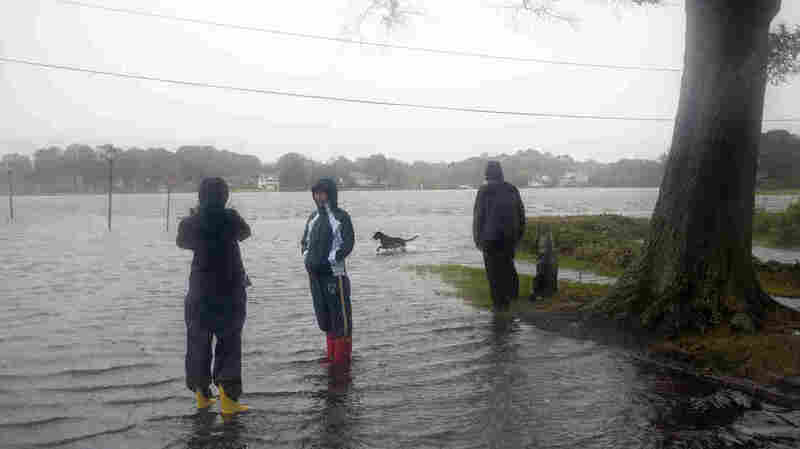 Just about everybody in Norfolk has a flood story. It's part of living in this low-lying port at the mouth of the Chesapeake Bay. Donna Woodward's story is about how she gets to her job at the local public radio station when storm winds are pushing water toward the city. "I have actually bought full-body hip waders because Hampton Boulevard, which is the main artery that runs past our house, is always hip deep in water whenever it's like that," says Woodward. But Woodward notes that things in Norfolk are better than they used to be, when even normal tides would cause flooding. "Our neighborhood, for instance, they spent some good money to elevate our street 18 inches," she says. "And ever since they've done that, honestly, we have seen, you know, like 4-foot, 3-foot tides that normally would have blocked off our street. No problem." Woodward says her street still floods during big storms, though. Also, the project was years in the making and cost more than $1 million to complete. And it didn't do anything to protect the houses along the street. Woodward's house has had major flood damage twice in the past five years, even though the electrical box has been raised and the air conditioner is on the roof. "I love this house. I love Norfolk. I love living here," Woodward says. "But it's incredibly stressful to know that this house either is going to have to be elevated or I'm going to lose it eventually." The city has been experimenting with this idea of elevating houses. So far they've put more than 20 on taller foundations. A new grant from the Federal Emergency Management Agency will pay to elevate five more at a cost of about $900,000. Paul Fraim, the mayor of Norfolk, says it will take a lot more money and a comprehensive plan to make sure his city is still thriving 30 years from now. "The city is slowly sinking into the Chesapeake Bay, and at the same time the sea level is rising," Fraim says. Tide gauges show the relative water level around Norfolk is more than 14 inches higher than it was in 1930. And the rate of sea level rise is increasing, especially between North Carolina and Boston. Even so, Fraim says he's optimistic. "It's a problem that if we know you work hard and get the very best science, that I think we can actually not only mitigate, but we can deal with and still do just fine." But not without a lot of planning and spending. The city already devotes about $6 million a year to improve stormwater drainage. And it has hired the U.S. branch of Fugro, a Dutch company, to come up with a long-term plan to keep the water out of several vulnerable neighborhoods. One of those projects involves a body of water with a Dutch name — The Hague. "The Hague is like many areas — you've got a little encapsulated basin with a small outlet. It provides an opportunity to create a barrier with a gate, so that you can close the gate, close the barrier when you have the tidal surge," says Tom McNeilan of Fugro Atlantic. "It's not a trivial expenditure. You're talking tens of millions of dollars for that particular project." Protecting that one little body of water will cost roughly $60 million. To protect all the neighborhoods in Fugro's plan would take about $1 billion. And protecting New York and New Jersey would take many times that amount. Communities say they can't do it without federal assistance. The dollar amounts are large, but McNeilan says previous investments in flood protection have paid off, such as the flood wall built in the 1960s that protects downtown Norfolk. "I think you could look at a picture of downtown Norfolk today looking over the flood wall and ask yourself: Would all that development have occurred without the flood wall? And I think the answer to that clearly is no," says McNeilan. The company where McNeilan works, Fugro Atlantic, is one of the businesses behind that flood wall.